Description: Protect your PC from Malware-based hacker attacks. a-squared Anti-Malware uses a unique approach to dealing with Trojans, Worms, Dialers, Spyware and Adware, providing an indispensable enhancement to any protection system, whether on a private PC or a company network. The unique Malware-IDS technology provides the first line of defense against individual attacks from specialized Trojans that cannot be recognized by conventional antivirus tools. Description: Scans your computer for malicious software (Malware), including Trojan Horses, Dialers, Worms, Spyware, Adware and more. a-squared Free is specialized in finding and removing them securely. 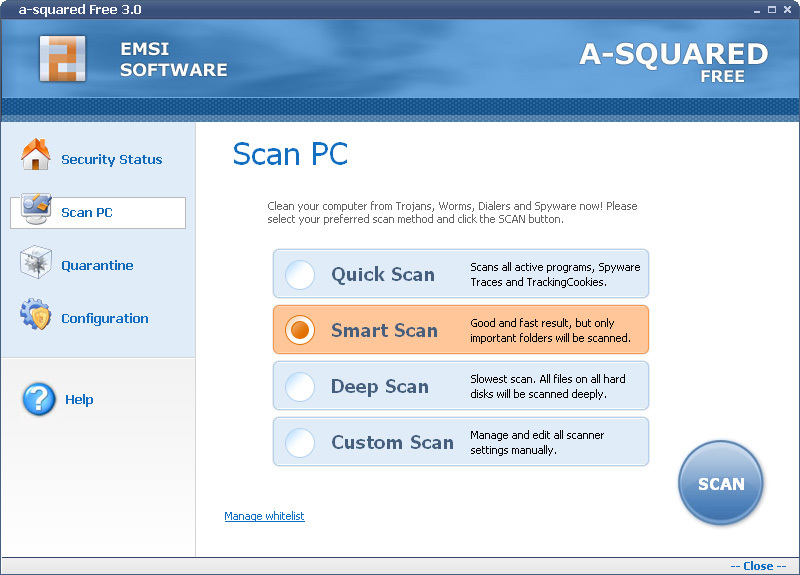 The disk scan checks all files on your system disks for Malware. 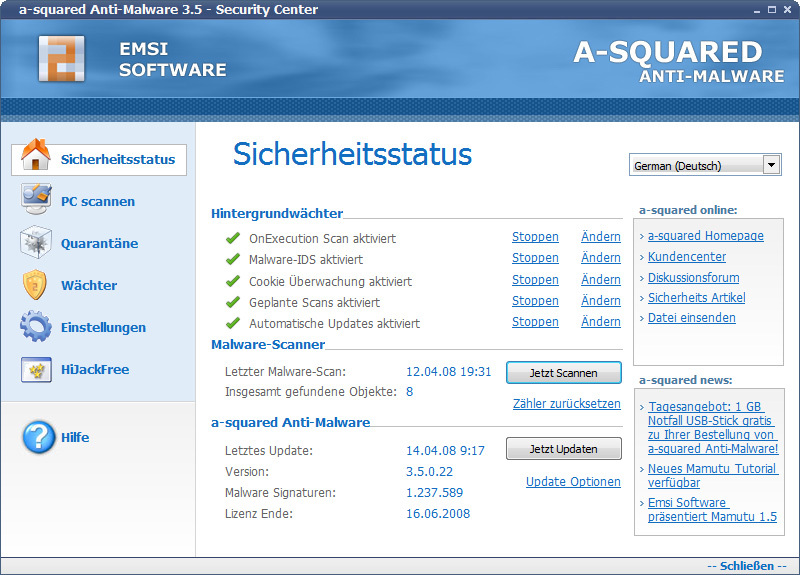 The scanner scans for Spyware Traces. Currently more than 1.2 million different types of Malware may be detected and removed. Free daily online updates provides the best protection. Description: Ad Removal Spyware is a security utility that helps protect Windows users from spyware, virus, Trojan, and other unwanted software. Even unknown spyware can be prevented and reported. Description: Adaware Spyware Removal protects against a wide range of spyware threats that can expose your confidential information and diminish your PC's performance. Adaware Spyware Removal offers simple-to-use yet powerful features: Comprehensive Spyware Detection and Removal provides comprehensive protection against a wide range of spyware, adware, keyloggers, browser hijackers and other threats. Description: Protect your PC against virus attacks,Trojans,Internet Worms,Malware and Spyware. Scan and Remove Spyware, Adware, KeyLoggers, Browser Hijackers and Dialers on your PC.Protect your PC with real time firewall monitoring and regular software updates. Remove viruses automatically and protect email and instant messages. Description: Advanced AntiVirus Protection! Protect your personal information and your privacy. Antivirus Advance removes viruses automatically and protects email and instant messages, while also protecting you from adware, spyware, emerging threats, hostile activity, unauthorized file deletion, and much more! - Unlimited virus protection definition updates. Description: Adware And Spyware Blocker can provide every computer with virtual protection against all types of unauthorized spyware and keystroke monitoring programs, both known and unknown. Adware And Spyware Blocker will find almost any spy related programs and its logged file on your system. Description: Adware And Spyware Software protects against a wide range of spyware threats that can expose your confidential information and diminish your PC's performance. Adware And Spyware Software offers simple-to-use yet powerful features. Description: Adware Anti Software Spyware protects against a wide range of spyware threats that can expose your confidential information and diminish your PC's performance. Adware Anti Software Spyware offers simple-to-use yet powerful features.